Jordan with its capital Amman is located in Asia (Middle East, northwest of Saudi Arabia). It covers some 89,343 square kilometers (about three-quarters the size of Pennsylvania) with 10,248,100 citizens. 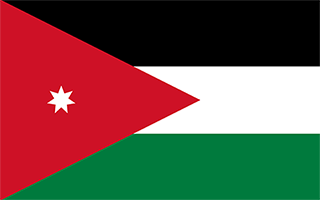 Arabic and English are the common languages used in Jordan. Iraq, Israel, Palestinian Territory, Saudi Arabia and Syria are bordering countries. The topography is mostly desert plateau in east, highland area in west with Great Rift Valley separates eastern and western banks of the Jordan River. The average density of population is about 115 per km². The climate in Jordan can be described as mostly arid desert with rainy season in west (November to April). Potential natural disasters are droughts, flash floods and periodic earthquakes. To reach someone Jordan dial +962 prior to a number. The local cellular networks are operated on 900 MHz, 1800 MHz, 3G, 4G. Websites typically end with the top level domain ".jo". If you want to bring electric appliances (e.g. battery chaarger), keep in min the local 230 V - 50 Hz (plugs: C, D, F, G, J). The sign for the locally used currency Dinar is JOD. Three equal horizontal bands of black (top), representing the Abbassid Caliphate, white, representing the Ummayyad Caliphate, and green, representing the Fatimid Caliphate; a red isosceles triangle on the hoist side, representing the Great Arab Revolt of 1916, and bearing a small white seven-pointed star symbolizing the seven verses of the opening Sura (Al-Fatiha) of the Holy Koran; the seven points on the star represent faith in One God, humanity, national spirit, humility, social justice, virtue, and aspirations; design is based on the Arab Revolt flag of World War I.